Please refer to our stock # 3516 when inquiring. 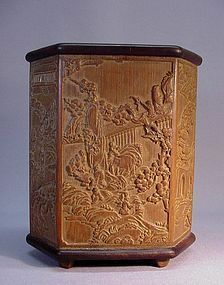 This very well carved bamboo hexagonal brush holder (Chinese name is Bitong) is an early 20th century product. It is 6 3/8” high, 5 ¾” wide and 4” in depth. The rim, bottom and four small legs are made of hard wood. The six images depict the idyllic paradise for Chinese scholar, sage or official. In those images people are chatting with itinerant Daoists, fishing on a lazy river, enjoying a fabulous rock garden, or strolling in the mountains, all themes of escape from the stress and complications of the real world. Aside from a crack due to age on the rim (see image no. 5), it is in great condition.